Somehow, with all the travels and family and workity work work, I believe I neglected to mention the morning I spent in a giant ball pit. My longtime friend M came to visit with her husband and three little girls, and their quick but delightful visit was one of the high points from last month. I have almost no photos to show from it, but that just means I spent the day being present and talking and listening without snapping away. Then again, I also have a video of three little girls and one baby boy with the giggles, which could make even the surliest grump laugh out loud. Good friends, good fun, good times. 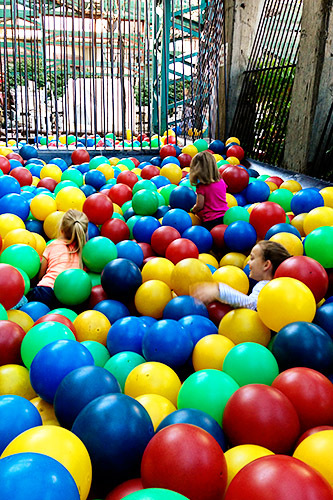 That's a SERIOUS ball pit! Those balls are 5x larger than I have ever seen. So glad you all were able to get together, put work on hold, and enjoy the day.